Excellent value and workmanship. Really easily fitted by myself and looks really excellent when finished. Well done Vanwurks! 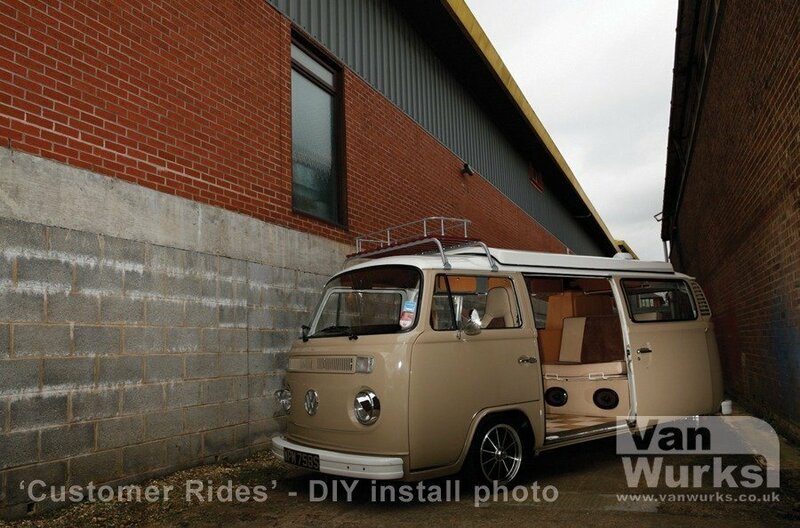 Thanks Nick, love the interior, it is beautifully made and has transformed the look of the van. Love it! We bought a 1972 bay a just over a year ago. It had previously been used as an ambulance and in the back were two stretchers, a wheelchair and assorted old medical equipment. 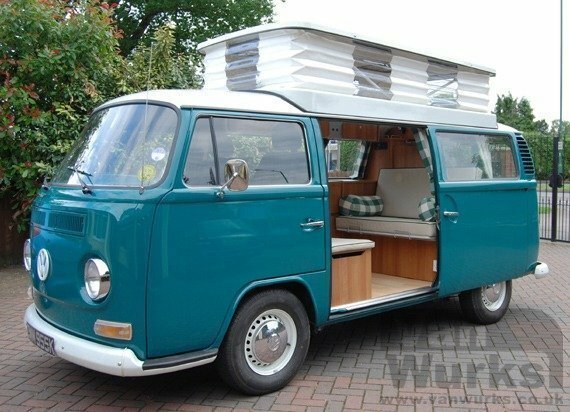 It was fascinating stuff but we had bought the van as a camper so I pulled it all out and sold it on EBay to a bloke in Tenerife. We checked out a few of the interior suppliers and spent some time discussing options with Nick at the 2010 Bus Freeze show. 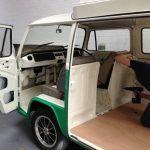 I had heard good reports about Vanwurks which was important as I was new to the VW camper scene and eventually we decided to get a Vanwurks interior. The next consideration was whether to buy it in kit form or have it fitted professionally by Vanwurks. We took the latter option, obviously more expensive but well worth it as Nick is a perfectionist and everything was done to the highest possible standard. Since that time we have been to loads of shows and been on a summer holiday tour of Wales, Suffolk and Norfolk. People everywhere are attracted by the bus, it is a really interesting old vehicle, (aren’t they all), and they all comment on how good the interior is. I only wish I could tell them that I did it myself! 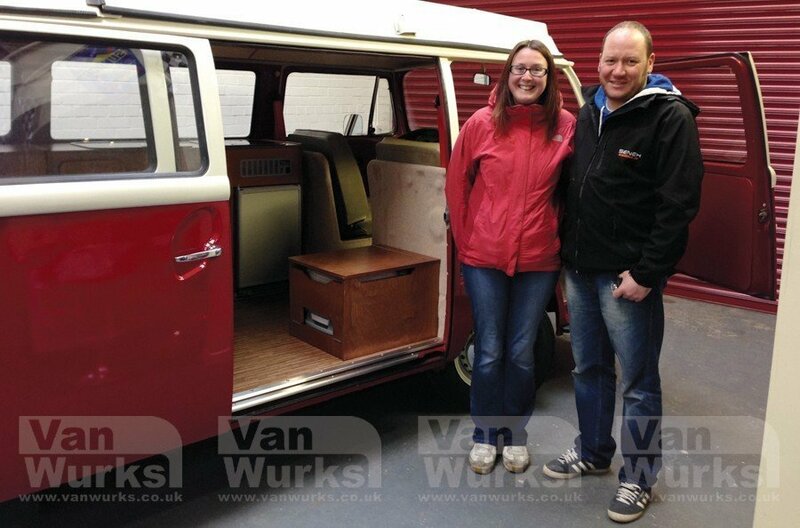 We are delighted with our Vanwurks interior, it looks great, is very comfortable and is very well designed. 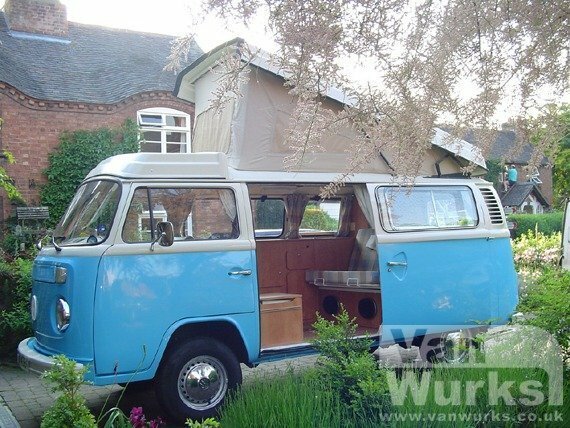 Everything works well, we have not had any problems and we would wholeheartedly recommend Vanwurks to anyone who loves their bus. 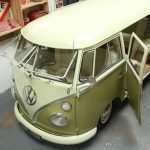 Having spent several years rebuilding my Bay from the ground up, I spent the summer looking for units to finish off the rebuild. I wanted a quality unit, something smart to look at, but practical for weekend use. Having done all the shows I settled on Vanwurks. My decision was spot on, the finished van looks fantastic yet great for everyday use with plenty of storage in the cleverly planned layout. From ordering through to delivery was easy, delivered on time and the instructions and templates etc made the fit very quick and easy. Three years on I haven’t seen anything on the market to better Vanwurks. We found the interior easy to fit with clear instructions. Its very functional, looks really good and has had lots of comments about it. Nick and family always seem to be there to help if needed and very friendly, we always chat to them at the shows. We are really impressed with the interior and found that it was incredibly easy to fit, it took less than a day! Its really transformed our van into a camper! 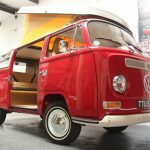 It’s been a year since I installed the campervan interior and thought I would take time to send you some photos and give you a testimonial, so here it is. The furniture is absolutely fantastic, exceptional quality and hard wearing, we love it. The van is now so comfortable and I hope the attached photos do it justice. I also want to thank you for your excellent service and care. I hope that business is going well for you, I saw another van at Farnborough VW Centre with your kit and it looked equally fab. Everyone I speak with seems to know about you guys and your reputation is second to none. Keep up the great work. Just wanted to say thanks , the unit is absolutely brilliant and the van looks great. I will start saving now so I can get the locker and buddy box to match ! Thanks again Nick. We have been very happy with every aspect of dealing with Vanwurks. The service and advice was excellent, the quality and finish of the interior is superb, it was very easy to fit even for the unexperienced and for the price nothing we saw came close. 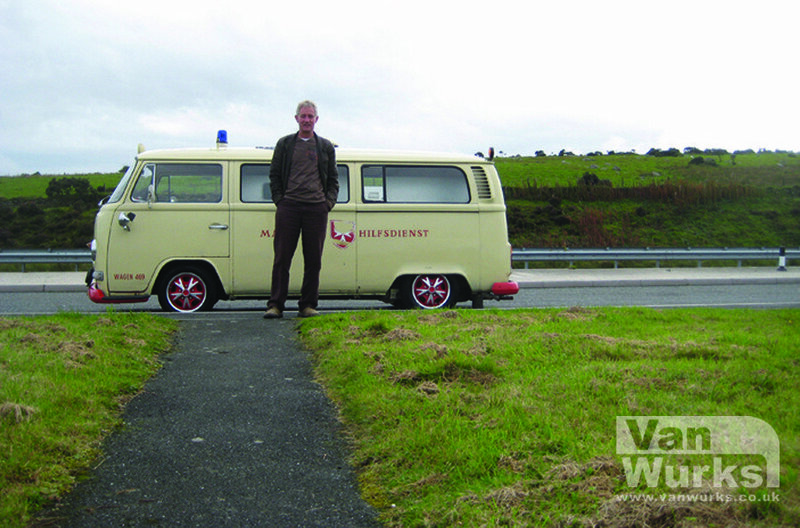 When I saw the Vanwurks demo van at Bustypes ’04, I knew immediately it was perfect for my bus. I loved the floorspace the side units provided and thought the layout of the fridge, grill and sink were just so logical. I managed to install the Vanwurks interior without any problems – even being female! Each unit had been designed with minute detail and analysis. I found Vanwurks provided me with some really useful instructions, an ‘idiot’s guides’ to fitting and Nick was always on hand (by phone or email) to assist with any questions. 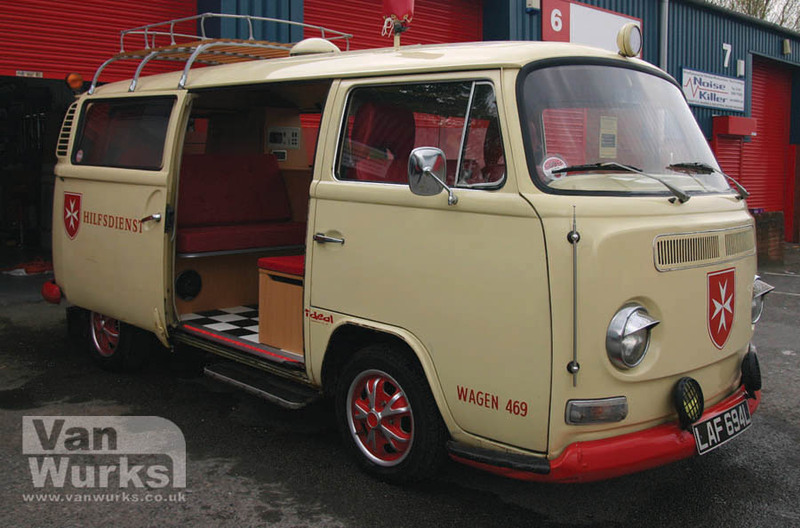 The modern, practical, high quality interior which Vanwurks produce has enhanced the bus and its value. “Vanwurks were excellent from start to finish ensuring that all work was completed on our new interior to a high standard. 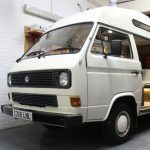 The interior finished off the camper and we are over the moon with her. We are looking forward to enjoying the van for many years to come.” Nick. The interior is a huge improvement on what we had before. We are looking forward to next summer when we can really get out and about to enjoy it. Retro radio is great. I am happy to recommend your work to anyone. Excellent workmanship and excellent service.